Windsor Farms Conditions and Restrictions, ca. 1930. 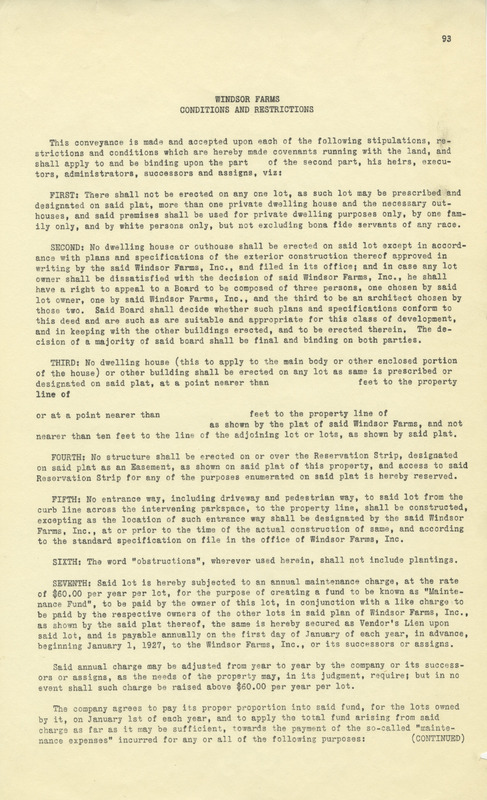 This neighborhood covenant required that the homes were occupied "by white persons only," excluding servants of other races. 1850s: Richmond is a classic “walking city,” with working-class residents living in close proximity to industry and commerce. Class defines neighborhoods more than race. The wealthy “live high” in neighborhoods such as Church Hill and Gamble’s Hill, while free blacks, hired slaves, and white working people tend to occupy the bottoms and industrial areas. Clusters of immigrants establish churches and self-help organizations near Navy Hill and in the western and eastern peripheries of the city’s suburbs(Rockett’s Landing and Oregon Hill). Around thirteen percent of residents are foreign-born. 1871: Virginia’s post-Civil War state constitution extends voting to African American men. The political wards of Richmond are expanded with the clear intent of creating a single, black-majority ward. Jackson Ward is nicknamed the “shoestring ward” because of its rambling boundaries. The ward is gerrymandered to hold as many black voters as possible, and thus limit black representation on Richmond’s city council. 1888: Richmond inaugurated electric streetcar service, the first in the nation with trolleys using overhead lines powered from a central station, and had thirty cars in operation by 4 May. The streetcars allowed the development of “streetcar suburbs” and greatly expanded the boundaries of the city. Restrictions on home ownership by deed or restrictive covenants makes most of these suburbs whites-only, and inaugurates the first “white flight” leaving poorer whites and African Americans in the center city. 1911: In April, the Richmond City Council adopted a residential segregation ordinance. 1912: On March 12th, the Virginia General Assembly passed legislation permitting all cities and towns to adopt residential segregation ordinances. 1917: The U.S. Supreme Court ruled in Buchanan v. Warley that residential segregation or ordinances were unconstitutional. 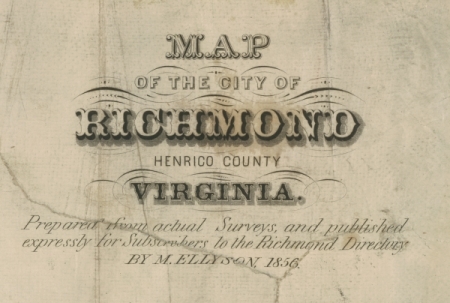 1929: Richmond adopted an ordinance based on Virginia’s newly adopted “racial integrity law” that prohibited a person from living in a neighborhood where he or she was not permitted to marry any member of the majority population. In less than a year, the U.S. Fourth Circuit Court of Appeals ruled that Richmond’s residential segregation ordinance based on the state’s racial integrity law was unconstitutional. These practices were prohibited under the 1968 Fair Housing Act. 1937: Home Owners Loan Corporation and the Red-Lining of Richmond. By working with local real estate agents in cities across the country, HOLC created Residential Security Maps based in significant part on the racial composition of neighborhoods. Those areas outlined in red or graded type D by the HOLC, were predominantly African American and found in the inner city. Areas labeled type C were classified as ‘working class’ and contained a larger number of whites. The vast majority of areas graded type A and B, were populated solely by Whites. The underlying racism of the HOLC grading system and the resulting lack of investment in predominantly African American neighborhoods is still prevalent today. 1940s & ‘50s: Federal public housing concentrated poverty in the inner city through the construction of public housing in East End Richmond. By and large, public housing units were constructed in neighborhoods receiving a D grade by the HOLC. Since that time, the efforts of Federal housing subsidies have been relegated to neighborhoods with the greatest poverty rates, in effect containing poverty to the inner city. 1954: Decided by the United States Supreme Court in 1954, Brown v. Board of Education declared state laws which established separate public schools for black and white students unconstitutional. In Virginia, the strong presence of the Byrd Organization paved the way for Massive Resistance which was characterized by the opening of private, apartheid schools and the flight of white, city residents into the neighboring counties. 1956: On 29 June, President Dwight D. Eisenhower signed the Federal-Aid Highway Act, initiating the interstate highway system. Virginia’s portion was to include 1,065 miles of roadway. I-95 would run through downtown Richmond, speeding tourists to the city but also displacing thousands of residents of Jackson Ward. 1950s: Construction of the Richmond-Petersburg Turnpike (I-95) and the division of Jackson Ward. 1960s: Neighborhood segregation was maintained through practices in the private real estate and banking industries. the city’s population from 52% to 42%. The U.S. Supreme Court ruled that the annexation was constitutionally impermissible . After many years of litigation , the Supreme Court ruled that the city could retain the annexed area on the condition that Richmond eliminate at-large elections and adopt ward or single-member district representation. 1970s: Total destruction of Fulton Bottom to make room for an industrial park that never materialized. Randolph and Oregon Hill neighborhoods cut in half by the construction of the Downtown Expressway. 1950’s-1990s: Total destruction of Navy Hill through the combination of highway construction & downtown redevelopment. 2000’s: Subprime Lending: The subprime mortgage lending industry was, by and large, non-selective when it came to originating inferior mortgage products. However, minorities were disproportionately more likely to receive a subprime loan than white borrowers. In Richmond from 2004 to 2011, subprime loans accounted for 31 percent of all loans in predominantly minority neighborhoods compared to just 5 percent in predominantly white neighborhoods. Foreclosure Crisis: The subprime lending spree resulted in the near total collapse of the economy and a foreclosure epidemic not seen since the Great Depression. African-American neighborhoods bore the brunt of the foreclosure crisis. Predominantly African-American neighborhoods experienced close to three times the number of foreclosures as did predominantly white neighborhoods.